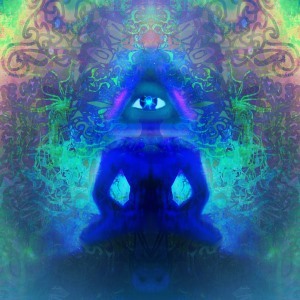 Meditate on the color blue to open up your third eye. Anyone who wants to explore subtle realms of perception can benefit from opening the third eye. Before embarking on this powerful journey, however, it's important to understand what the third eye can do. Opening this energy center will allow you to access your deepest intuition. Your third eye, located in the middle of your forehead at the pineal gland, is one of the most powerful energy centers you can find. Many feel that the pineal gland is an important spot for triggering psychic abilities. Awakening your third eye gives you a way to see beyond space and time. Additionally, it raises your frequency and allows you to move into a higher consciousness, helping you see past physical sight. At first, you'll likely only use your third eye when you close your regular eyes, but with time and practice, you can train yourself to be open to messages through your third eye when you have your eyes open. Awakening your third eye will bring on an increase in messages through dreams as well as newly honed psychic abilities. When you fully open the energy center in your third eye, you'll bring to life your intuition. Developing third eye abilities can be challenging for many, though. A psychic telephone reading can help you get started by figuring out which techniques will work best for you. Fortunately, there are a few things you can focus on and carry out in your daily life that will help you open your third eye. Cultivating silence for your mind is key to opening up your third eye. There are many ways to bring silence to your mind, such as by calmly sitting in nature or practicing meditation. When your mind is cluttered with noise and busyness, it's easy to miss the messages it's sending to you. Third eye perception lets you access your senses on a more subtle level, so it's essential that you listen to the whisper of its messages. Have a psychic chat online to learn more ways you can foster silence in your mind. Though it might seem counterintuitive, it's very important that you learn to ground yourself before you can open your abilities through your third eye. Awakening your third eye gradually is also important, as it will let you create a reliable foundation for interpreting what you perceive with discernment and clarity. The information that makes its way to you through your third eye can seem unfamiliar, unusual, or even disturbing to a mind not used to these things. Grounding yourself supports a healthy opening of these subtle ways to perceive, and it gives you the calm energy you need to interpret what you sense effectively. Once you're grounded and in tune with your mind, listen for the whisper of your third eye. Mindful breathing will help ground you and calm your mind. Visualize and meditate on the color purple or blue to active your third eye, then explore the wonders of these new realms of perception.